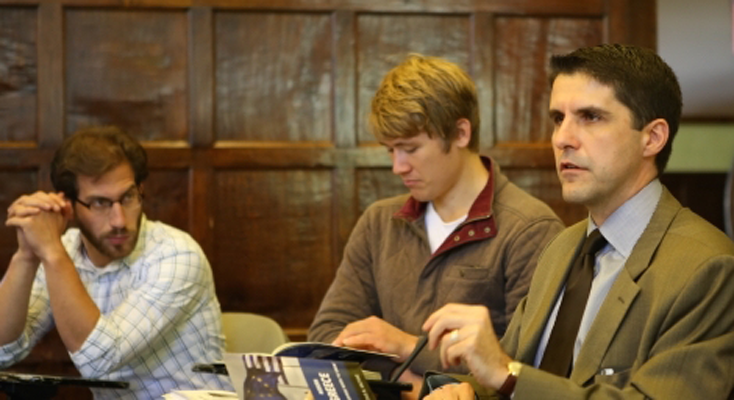 Ioannis Evrigenis spoke on the topic of Greece to the EPIIC Colloquium on October 6, 2015. Ioannis D. Evrigenis teaches courses on ancient and early modern political thought, the social contract, and ethics and international relations, as well as seminars on Plato, Machiavelli, Hobbes, and political theory methods. Professor Evrigenis is co-editor of Johann Gottfried Herder's Another Philosophy of History and Selected Political Writings (Hackett, 2004). He is also the author of articles on a wide range of topics in political theory, and of Fear of Enemies and Collective Action (Cambridge University Press, 2008), which received the 2009 Delba Winthrop Award for Excellence in Political Science. His most recent book is entitled Images of Anarchy: The Rhetoric and Science in Hobbes's State of Nature (Cambridge University Press, 2014). At present, he is overseeing The Bodin Project at Tufts, aimed at an electronic variorum edition of Jean Bodin's Les six livres de la république, funded in part by a Tufts Innovates! grant. He has received grants and fellowships from Princeton's University Center for Human Values, the National Endowment for the Humanities, the American Philosophical Society, the Alexander S. Onassis Public Benefit Foundation, the Earhart Foundation, and the Harry Frank Guggenheim Foundation, as well as five Certificates of Distinction in Teaching from Harvard University's Derek Bok Center for Teaching and Learning.